10 ton; 460 Volt; 3-Phase; R-22 Scroll Compressor. Technical Specifications: 10 ton; 460 Volt; 3-Phase; R-22; 60 Hz; RLA: 19.2; Oil Type: Mineral; Suction Size: 1 3/8 inch Stub Discharge Size: 7/8 inch Stub. Overall Length: 10.38 inches; Overall Width: 11.23 inches; Overall Height: 21.00 inches. Replaces Part Numbers: ZR125KC-TFD-950; ZR125KCTFD-950; ZR125KC-TFD950; ZR125KCTFD950. 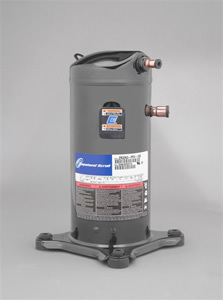 Used in American Standard; Trane Air Conditioning Models: CSHA100K0A0A and many others. Used in Amana; Goodman; Janitrol Air Conditioning Models: CE120-4; CE120-4A; CE120-5; CE120-5A; KCE120-5A.